Van Damme habitats include marine, coastal beach, coastal bluff terrace, wetland, pygmy forest, redwood forest, and riparian. Bishop pine, coast redwood, red alder, willow, grand fir, and western hemlock grow along the Little River, which also provides habitat for steelhead, Coho salmon, stickleback, and both prickly and Coast Range sculpin. Local birds include yellow warblers, belted kingfishers, Swainson’s thrushes, and northern spotted owls. 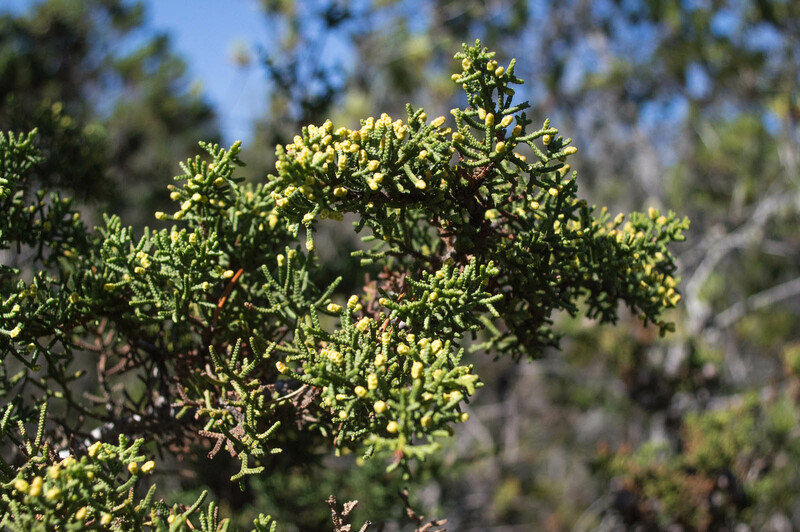 Unique to the pygmy forest, the Bolander pine is a close relative of the beach pine that grows along the coast and the lodgepole pine in the Sierra Nevada. Pygmy cypress and Bolander pine often grow in thickets of small cane-like trees that are biologically mature and bear fertile cones. Found only on coastal terraces between Fort Bragg and Anchor Bay. When not in poor soil, a tree can grow over a hundred feet tall; here a tree with a trunk diameter of one quarter inch, standing only a foot or two high, may have as many as eighty growth rings. Some of these trees are undoubtedly more than a century old. A dominant low shrub with very small leaves, mostly restricted to the pygmy forest. The taller hairy manzanita (Arctostaphylos columbiana) is also found here. A taller tree that often borders and frequently grows within the pygmy forest, the Bishop pine has a larger cone and much longer grayish needles than the greener-hued Bolander pine. Both pines retain their cones for many years; some cones remain closed until a fire opens them to spread the seeds that start a new forest. California huckleberry grows in many forests along the Pacific Coast and is common in the pygmy forest. The edible berries (ranging form shiny black to powdery blue) were an important part of the diet of the Native Americans, who regularly set fires in the pygmy forest to increase the next year’s yield. The huckleberries were eaten fresh or dried for winter use. Dwarfed in the pygmy forest, this species is five times taller in the neighboring redwood forest. But it is less dwarfed than the other plants because it thrives in acid soils. In spring, its pinkish-red blossoms dominate the landscape with spectacular displays. The annual migration of wild Coho (or silver) salmon from stream to sea and back again is a massive surge of energy and nutrients that weaves the land and the ocean into one vital web. These salmon enter the sea as small fish, tiny sparks of life, and return to Little River large, strong and sleek. Here they spawn, renewing their population before they die. Their decaying bodies, made up of nutrients absorbed during the years at sea, now feed millions of stream and forest creatures, including the very small trees that shaded them when they were young. The salmon that spawn in Little River are unique because they have adapted to the particular chemistry, temperature, geology, plant and animal life of the Little River. Unlike most of the coastal streams in northern California, no hatchery-raised fish have ever been introduced here. Could redwoods be harmed by climate change? Well, they don’t seem to be suffering so far. But scientists say that increasing temperatures, along with decreasing summer fog, could pose a threat in the decades to come. To find out more about the effects of climate change in California’s redwood parks, go to this Save the Redwoods League web page.